In our last post we saw the different settings associated with Calendar Appearance where we discussed about calendar language, date format, delivery date fields etc. Today we shall have a look at how to change the labels for Delivery Date field and its position on the Checkout page using Order Delivery Date Lite for WooCommerce plugin. You can make changes to the Field Label as per your business requirements and therefore this field will be labelled differently for different businesses. For instance, if you have a store where you only provide pickup for your products and do not deliver them, then you can set the Field label as Pickup Date. Other label option for this field could be Preferred Delivery Date for the deliverable products etc. The placeholder text is a short hint that describes the expected value of the input field. It will disappear when you will start selecting the date in the field. To set placeholder text for the Delivery Date field on the checkout page, you need to add the text message in Field Placeholder Text text box. You can set the placeholders like Select the Date or Choose your Pickup Date as per the business requirements. Field Note Text option allows you to provide an additional information or a note related to your deliveries. For instance, if you require minimum 48 hours to prepare for a delivery, then this information can be conveyed to the customers through this note. In this case the Field Note text will be ‘The earliest delivery possible for this order will be after 48 Hours. Please select the delivery date accordingly’. For earliest delivery, please refer to our delivery policy. Orders set for pickup will be available after 2:00 PM on the scheduled day. As the name suggests, this option provides liberty in placing the Delivery Date field on the Checkout page. 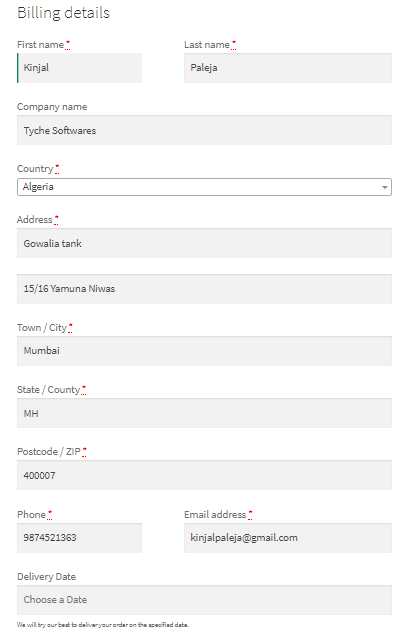 Sometimes you want to have Delivery Date field under specific sections as per the business requirements and Fields Placement option on the checkout page makes this possible. You can place the fields in Billing Address section, Shipping Address section, Before Order Notes or After Order Notes on the checkout page. To set this up, go to Order Delivery Date -> Order Delivery Date Settings -> Appearance tab. You can select the radio buttons for the options where you want to place your Delivery Date field. Since we have selected In Billing Section, the fields will be added in the Billing Address Section on the checkout page. The Delivery Date field will be added at the bottom of the Billing Address form on the checkout page. Another option for placing the Delivery Date field in the Shipping Address section. Some businesses demand having delivery date field in the shipping section instead of billing section as the delivery address of the order can be different from the billing address of the customer. As you have selected the shipping section, Delivery Date field will be added at the bottom of the Shipping Address form on the checkout page. If the shipping option is disabled under WooCommerce -> Settings, then the Delivery Date field will not be displayed even if the shipping option is selected. The third option to add the Delivery Date field is Before Order Notes section of the checkout page. This option is mainly used for businesses who only deliver the products on the customer’s billing address and does not allow delivery at different address. 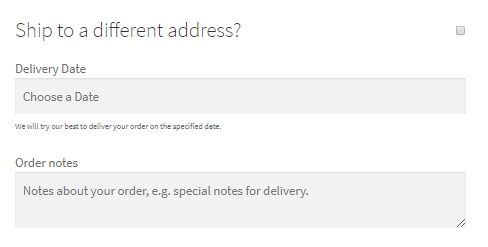 Therefore in such cases, the delivery field is required to be displayed in place of the shipping address, hence you can select the Before Order Notes option. The last option available for placing the Delivery Date field is After Order Notes section on the checkout page. You can select this option if you want to place the field after the Order notes section on the checkout page. 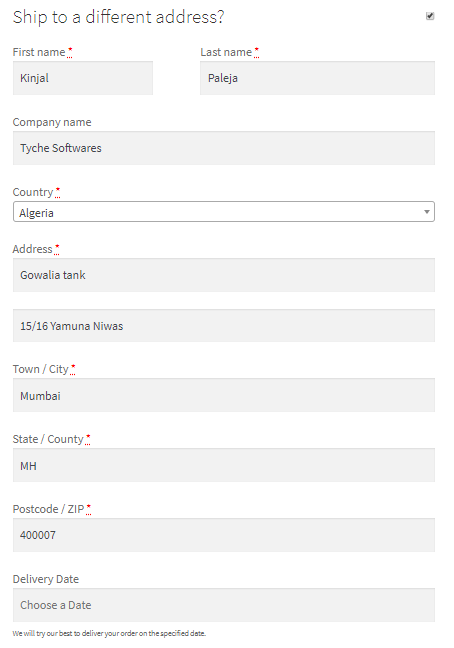 In this post we discussed about adding/changing the field labels, adding informative notes to delivery field and how we can place the Delivery Date field in different sections as per the business requirements. All these options are available in the Calendar Appearance section under Appearance tab. These options can help you make your Checkout page include more informative delivery fields for efficient order delivery. Amendments on the checkout page related to your delivery requirements can take upto 15 minutes in total.